At Beach Palace all the in-room amenities have been chosen for your comfort and convenience. From the double whirlpool tub, to the mini-bar filled with sodas, water, juices, and domestic beer, your stay with us will be unforgettable. 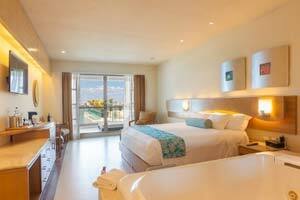 2 connecting Superior Deluxe - Lagoon View rooms. One room with a king bed and connecting rooms with 2 double beds. Double Whirlpool Tub, In Room Wine, Mini Bar contains sodas, bottled water & imported beer, liquor dispenser contains premium brands. Private bath w/ shower only. Balcony with chaise lounge, chairs & table. Welcome amenities for families, Xbox 360/DVD player in the room, Selection of Xbox Games upon request, Selection of DVDs upon request, Fun in the Sun Bucket Kit, special room service menu for kids, A fully stocked mini-bar in the kids’ room offers Hershey’s milkshakes, juice, soda, water, and snacks, plus kid friendly snacks and chocolate milk in minibar. Smart TV with YouTube, vTuner and Weather Channel. Purified Water. CHI branded hair tools & bath amenities, Bathrobes & Slippers. L’Oreal Kids bath amenities, kid-sized slippers and robes. Digital safe (laptop size). Individually-Controlled A/C. Coffee Maker. Direct Dial telephone. Alarm Clock. Iron/ironing board. Wireless Internet. 24-Hour room service & Turndown Service. Lagoon View. Non smoking room. Max Occupancy: 6 guests, including children (ages 4-17 & infants (0-3) four adults maximum. A maximum of 1 infant (ages 0 - 3) will be allowed to stay in the same room with 6 guests. This room may be booked with reservations without children. Located on floors 5 through 10, the Concierge Level rooms at Beach Palace feature an abundance of exclusive resort amenities. These include upgraded L’Occitane bath amenities, two massages, nightly petit fours with your turndown service, upgraded liquor brands in dispenser, bathrobes & slippers so you can make yourself comfortable while relaxing in your suite, and complimentary red wine upon your arrival. A Double Whirlpool Tub for you to relax in while kicking back in your room. Exclusive concierge phone service is just one of the few of the exclusive benefits afforded Concierge Level guests. Maximum occupancy is two adults. All rooms and suites at Beach Palace are non-smoking. Max Occupancy: 2 guests. 440 Sq. Ft. The living space includes a - 1 King size bed - Upgrade liquor liquor dispenser - Mini bar with soft drinks, juices, bottled water, and international beer (Corona, Budweiser & Bud Light) - Apple TV with WiFi connection and special apps including, iTunes, Netflix and more*. - DVD player - iPod Dock / Clock Radio - L'Occitane bath amenities - Comfortable slippers - Pillow menu - Professional Hair Dryer and Chi products - Beach bag - Aromatherapy menu - Espresso/American coffee - Room service menu - Turndown - Petit fours nightly - Purified water - Electronic safe - Individually controlled a/c - Bathroom with double jacuzzi - Wireless Internet - Balcony with doublé bed /2 chairs and 1 table *Apps on Apple TV may require guest subscription. The Superior Deluxe Ocean View suite will wow you with amazing views of the Caribbean. 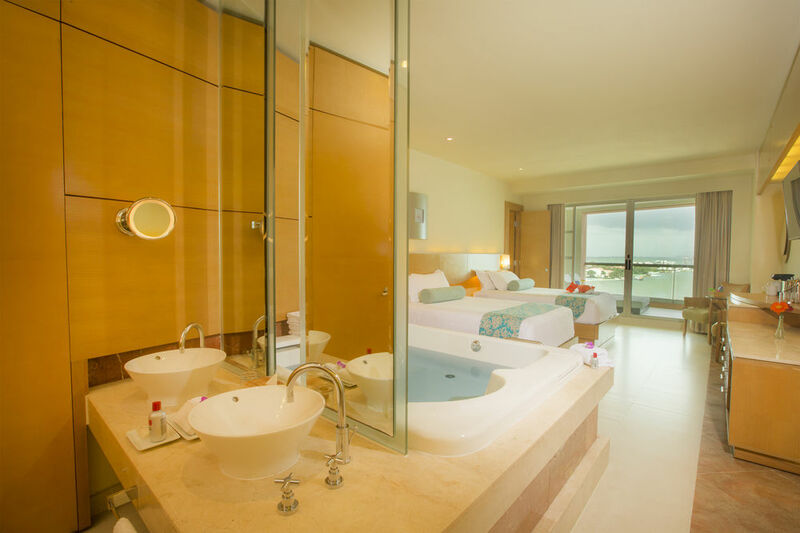 The suite accommodates up to 4 guests, including children and infants. Wake each morning to an inspiring view of the Caribbean from your private balcony. 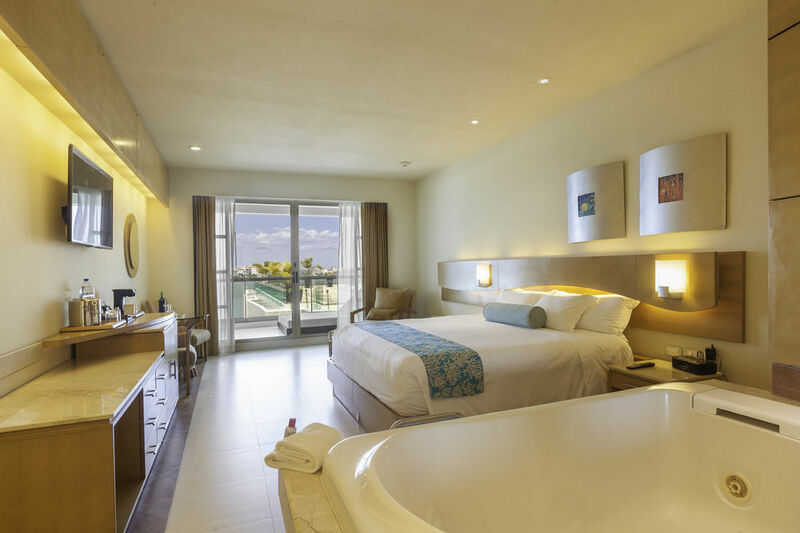 The suite is equipped with either 1 king or 2 double beds, and enjoy the abundant in-room amenities provided in all Beach Palace guest rooms and suites. All rooms and suites at Beach Palace are non-smoking. A Double Whirlpool Tub for you to relax in while kicking back in your room. You can comfortably watch a movie or show via our Smart TV with YouTube, vTuner and Weather Channel, and enjoy any of the refreshments found inside your in-room mini-bar. You will also find a coffee maker to help you get up and enjoy the day, and to help you feel great and energized. There is a digital safe (laptop size) to help you keep your valuables safe and out of sight. The mini bar contains sodas, bottled water, juices, domestic beer, liquor dispenser & imported beers. Max Occupancy: 4 guests, including children ages 4 -17. A maximum of 1 infant (ages 0-3) will be allowed to stay in the same room with 4 guests. 440 Sq. 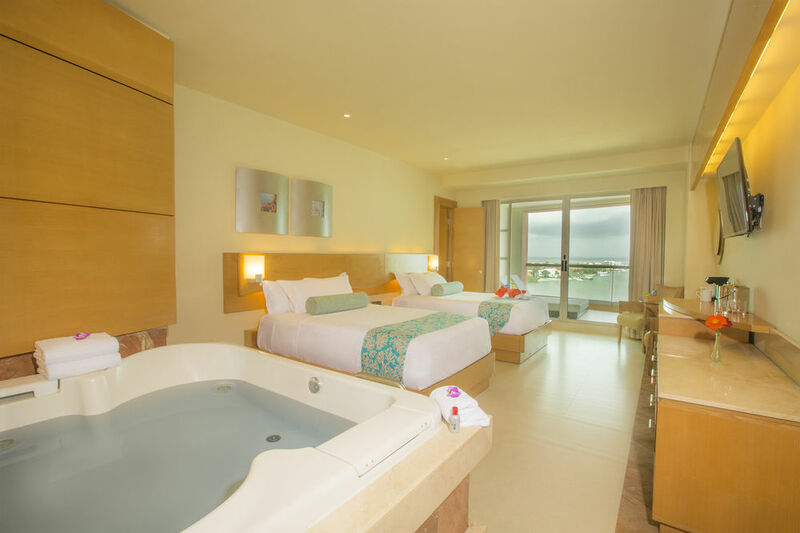 Ft.
Our Superior Deluxe Lagoon View suites offer views of the breathtaking Nichupte Lagoon from your private balcony. The suite is equipped with either 1 king or 2 double beds. The suite is equipped with an Smart TV with YouTube, vTuner and Weather Channel, so you can enjoy a movie or TV show while relaxing indoors. 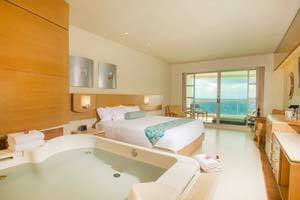 There is also a Double Whirlpool Tub for you to relax in while kicking back in your room. If you’re in the mood to celebrate, you only need to look inside your in-room mini-bar which is filled with sodas, bottled water, juices and imported beers. You will also find a liquor dispenser in the room, as well as a bottle of red wine, upon your arrival. You can secure your valuables inside the digital safe found in your room and kick back for a few minutes with our complimentary (and cozy) bathrobes and slippers. Set the individually controlled air conditioning to your liking, and get ready to have the vacation of a lifetime. Max Occupancy: 4 guests, including children ages 4 -17. A maximum of 1 infant (ages 0-3) will be allowed to stay in the same room with 4 guests. 440 Sq. Ft. All rooms and suites at Beach Palace are non-smoking and rooms for the physically challenged are available. 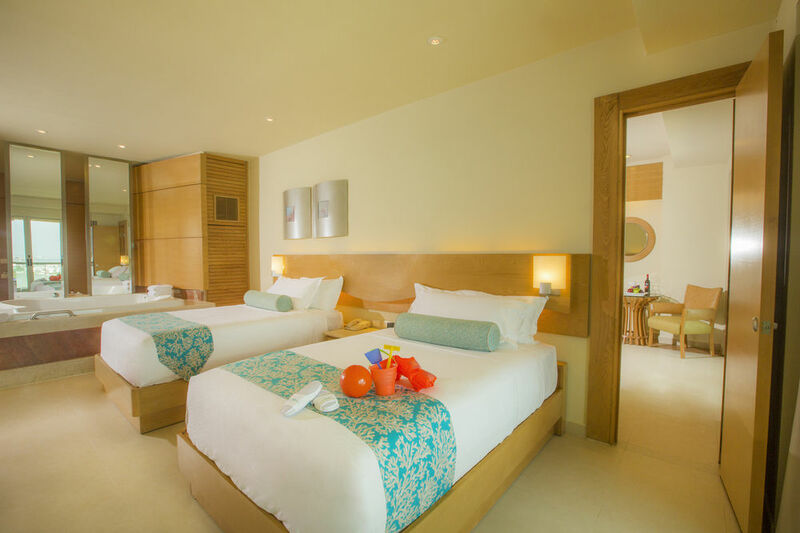 As you walk into your Deluxe Resort View suite at Beach Palace, you’ll notice the beautiful and welcoming atmosphere. Take a load off as you relax on your private balcony and enjoy a delicious breakfast or lunch which you can order using the 24-hour room service amenity. Designed for up to 4 guests, including children and infants, the entire family can sleep comfortably and have an amazing time. 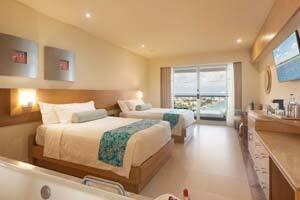 The suite is equipped with either 1 king or 2 double beds, and enjoy the abundant in-room all-inclusive amenities provided in all Beach Palace guest rooms and suites. You can comfortably watch Smart TV with YouTube, vTuner and Weather Channel, and enjoy any of the refreshments found inside your in-room mini-bar. A Double Whirlpool Tub for you to relax in while kicking back in your room. You will also find a coffee maker to help you get up and enjoy the day, and to help you feel great and energized, There is a digital safe (laptop size) to help you keep your valuables safe and out of sight. The mini bar contains sodas, bottled water, juices, domestic & imported beers. A maximum of 1 infant (ages 0-3) will be allowed to stay in the same room with 4 guests. 440 Sq. Ft. * This category is not open to Groups as availability is limited. The views are limited and could be partially obstructed. This category does not include any ocean view rooms. All rooms and suites at Beach Palace are non-smoking.